The HEAVYWEIGHTS will complete the back half of their two-week home stand by facing #3 Brown for the Atalanta Cup. Racing starts at 9:30 am. If you’re planning on coming to the race, please park at the Corey Ford Rugby Fieldhouse and use the (free) athletic department shuttle to get to the finish line viewing area at the Chieftain. The WOMEN will travel to Philadelphia to take on #9 Penn and #2 Princeton on the Schuylkill. Racing starts at 9:30. The LIGHTWEIGHTS will travel to Ithaca to race Cornell for the Baggaley Bowl. Racing starts at 8:45. “The freshmen carried the day, posting an eight-second victory over Boston University, with Rutgers trailing. The frosh took four seats in the start, several more on the settle, broke open water by the thousand, and never looked back. It’s been exciting to see the crew develop: As the varsity has gained speed with personnel changes and improved execution, the frosh have continued to nip at their heels in our intra-squad races each Wednesday. 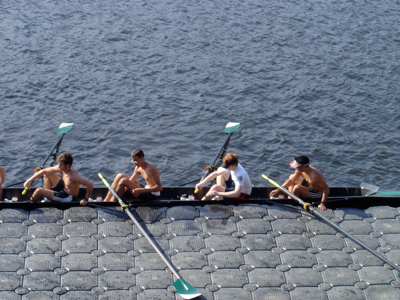 “The varsity crews faced stiff competition. Boston University has two 2008 Olympians and an Under-23 World Championship silver medalist, along with a new coach, Tom Bohrer, who has his own collection of Olympic and world championship hardware. But our crew hung tough with BU’s talent. BU jumped off the line to a seven seat advantage, showing us that we still have to improve on our start, but we held that into the third 500 before they moved away. The line came with Boston a little more than a length of open water ahead, and us a similar margin over Rutgers. Our 2v also finished ahead of Rutgers and behind Boston. “Radcliffe taught our 1V a valuable lesson this weekend: we need to bring our "A" game to the line on race day and perform at our absolute best to be competitive in the top tier of our league. The varsity got off the line with Radcliffe and held contact for about 1000m but did not respond to Radcliffe's moves with urgency. Radcliffe took control and then walked away in the second thousand. Syracuse fell back right away and luckily did not pose a threat. We lacked sharpness and just rowed a sloppy race. Tough to admit, but perhaps it was complacency after last week's race against Yale... We did not display the same aggression and attack. I split the 1V into coxed fours yesterday to force them to battle each other and reclaim their racing instincts. Radcliffe delivered us a timely wake up call. We race #2 Princeton and # 9 Penn this weekend. The 1V knows that if they cannot come ready to perform at their true top speed, they shouldn't get on that bus to Philadelphia. We will focus on execution. “The Dartmouth lights faced two league opponents, Yale and Columbia, this weekend. Racing in New Haven Saturday Yale proved to be one of the top teams in the league this year, handling the Dartmouth 2F, 3V, 2V and 1V by open water margins. The 1st Freshman eight fought hard the entire race to be upended by 1.5 seconds in the last 700m by the Elis. “Sunday Dartmouth faced Columbia in Hanover. Anxious to show more speed than displayed versus Yale each Dartmouth eight grabbed a substantial lead off the starting line. Unfortunately Columbia settled to a stronger rhythm and pressed Dartmouth’s lead in the third 500m. Dartmouth was unable to respond in the 2V and 1V and eventually lost to their Columbia counterparts by 4 seconds in both races, respectfully. The frosh fought back in the fourth 500 to only run out of race course and lose to the Columbia freshman by 1.1 second. “This left the overall Subin Cup record at a 12-12 tie since its inception in 1985. While the Durand Cup record slips to Dartmouth having 15 wins to Yales’ 39, with Rutgers – who are no longer participating - winning the Durand cup 6 times.